The Purcell Wilderness Conservancy was formed in 1974, and is recognized as "one of the most significant wilderness areas in southern British Columbia." (PWC Master Plan). At the north end of Kootenay Lake, lies a unique, virtually intact wilderness mountainside, that reaches from lakeshore to mountain peaks. It is bordered on three sides by the PWC. Mt. Willet, the highest mountain rising out of Kootenay Lake, presides over this west facing slope, from Hamill Creek, Argenta in the north to Fry Creek, Johnsons Landing in the south. In the forming of the PWC in 1974 and the subsequent boundary revision in 1995, this slope, known locally as the 'Argenta-Johnsons Landing Face,' was not included. Now, this landscape is being threatened. It is currently, included as part of Porcupine Wood Products/Cooper Creek Cedar’s Forest Stewardship Plan, which was just approved in January 2018. Until the Argenta-Johnsons Landing Face is protected within the PWC, it is continually at risk for resource development, particularly commercial logging. Our goal is the legislated inclusion of the Mt. Willet wilderness, from mountain top to lakeshore (excluding private land) within the Purcell Wilderness Conservancy Provincial Park. This will permanently protect a disappearing essential wilderness and enhance the viability of the PWCPP. We seek public and political support for this inclusion proposal. completing the park from mountaintop to lake shore. Your petitioners respectfully request that the Honourable House pass legislation to include the Mt. Willet Wilderness in the class A Purcell Wilderness Conservancy Provincial Park. 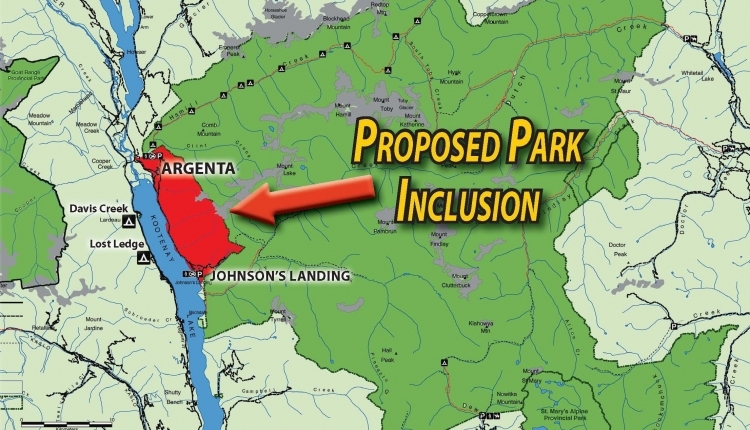 The Argenta-Johnsons Landing Face inclusion in the Purcell Wilderness Conservancy Provincial Park petition to The Honourable Legislative Assembly of the Province of British Columbia, in Legislature Assembled was written by Mt. Willet Wilderness Forever and is in the category Environment at GoPetition.